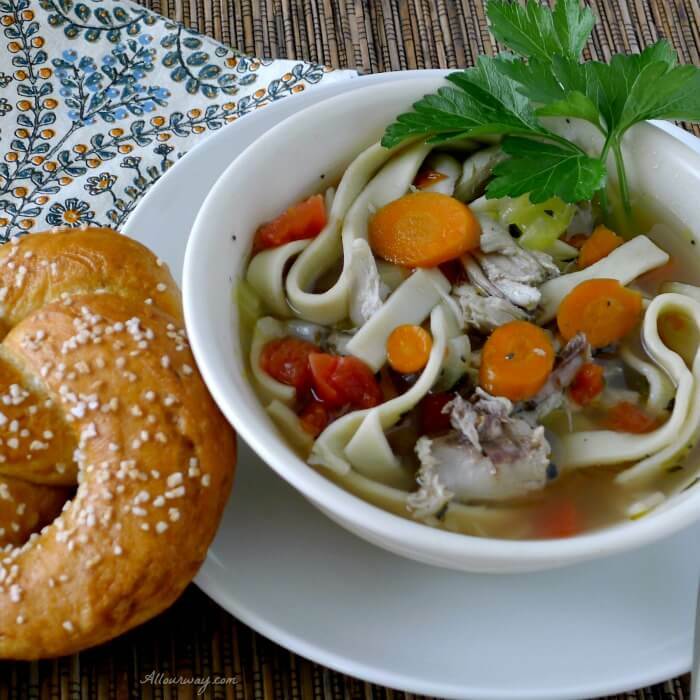 Tis the season — the season to be jolly and the time for a big bowl of Homemade Chicken Noodle Soup. What could be better than homemade soup made with a whole chicken that is slowly simmered with celery, carrots and onions? It’s the whole chicken that makes the broth extra rich, full of flavor and loaded with nutrition. At the first sign of a sniffle, I remember my mamma would pull out the old battered soup pot and then she’d go about making homemade chicken noodle soup — the best medicine in the world. We eat chicken — a lot. We stick it in our soups, put in on the grill, bake it with lots of lemon and garlic, we’ve even been know to fry it a time or twenty 🙂 You’ll always find some form of chicken in our freezer. So, whenever we make a dish we’ve made countless times before, we look for ways to make it just a little bit different. I’m certainly not saying that our Homemade Chicken Noodle Soup is boring and needs a little flavor boost. Far from that! We just like the challenge of giving a long time favorite a little different take. Now I know I’ve mentioned a few times before how much my Honey loves spicy and his Ro-tel tomatoes. (No we are not being compensated by them — we should with as many cans we go through.) He likes it so much I’m surprised he didn’t request that I make a Ro-tel gelato. Anyway, we made the broth the usual way, removed the chicken and placed it on a platter to cool and later shred. We strained the broth through a sieve. In our Dutch oven we briefly sautéed diced carrots, celery and onion. The broth went into the Dutch oven as well as the shredded chicken. This is when inspiration struck! My Honey decided to dump a can of Ro-tel tomatoes into the broth. 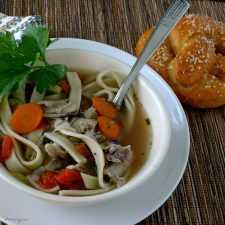 Now, if you don’t like spicy you can eliminate this, the Homemade Chicken Noodle Soup will still taste wonderful. But between you and me, it was pure genius to put that added kick to the soup. After all, don’t they say that spicy food is good for you?? We made homemade noodles to go into the soup but if you don’t have the time or the inclination you can always add the store-bought variety of your choice. We served the soup with our homemade pretzels. The soup is great for lunch, as a first course, or because you’re felling puny. 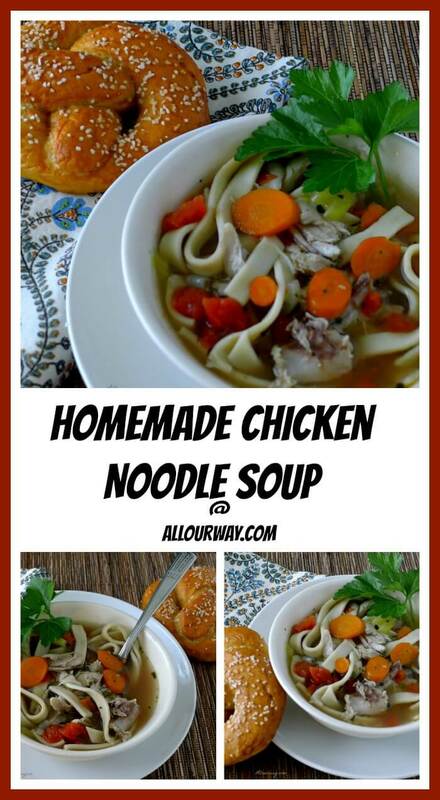 I love this recipe of Homemade Chicken Noodle Soup. It’s the next best thing to having a great big comforting hug from my mamma. 2 cups 2oz. homemade noodles or store bought. Place chicken in a large soup pot with the cold water and the rest of the broth ingredients. Slowly bring the liquid to a boil then turn down to a simmer. Cover and simmer gently for about 1 1/2 hours. Remove foam if some forms on top. It is important to let the broth cook slowly -- it will make for a clearer broth. Remove chicken and place on a platter until you can remove chicken from the bones. Tear into bite size pieces. Strain the broth through a fine sieve -- you'll have about 2 1/2 quarts. In a Dutch oven heat the oil and sauté the carrots, celery and onion for about 3 minutes. Don't brown. Add the broth, chicken and herbs and simmer for about 30 minutes. Add the can of tomatoes and continue to simmer for an additional 10 minutes. Whenever we add pasta or noodles to our soups we first cook the pasta or noodles in salted water and then add it to the soup. Don't overcook the pasta or the noodles. Once they go in the soup they'll continue to cook a bit more. You don't want mushy pasta/noodles. Put the noodles into the soup and heat for an additional 2 -3 minutes. You’re welcome. It’s always good to have the help and support of Someone greater than us. 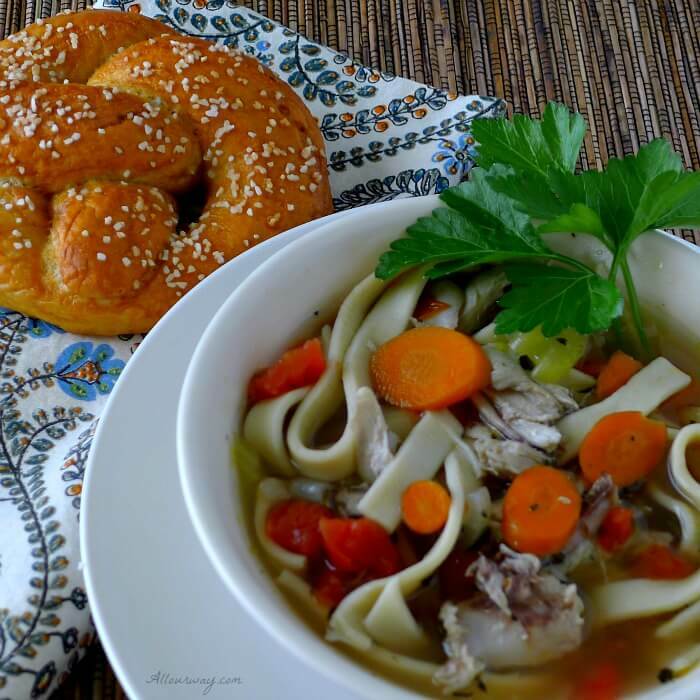 There’s nothing like a homemade chicken and noodle soup. This looks perfect! Thank you Molly! This time of year I want soup all the time. Pure comfort food, and the perfect cure for a sore throat! I hope you don’t have a sore throat, Richa and if you do I hope you’re better soon. I think soup is a perfect cure for anything. Whatever noodles you put in there will be just fine. The broth and soup are the stars. Hope you make it and enjoy it. It’s just starting to get cold here in the south and I’m all about soup right now! Where was this when I needed it last week, yum! Better late than never 🙂 Hopefully the weather will start to warm up — we’ll be coming in your direction to escape the cold. That’s the perfect remedy for the winter blahs. Unfortunately, I’ve made two pots of chicken soup this week while I’ve been sick with a nasty cold, and it hasn’t helped this time!! I should have added those Ro-Tel tomatoes!!! Oh I am so sorry to hear that you’ve had a cold. Sometimes those viruses are just terrible to get rid of!! Well, I haven’t had a cold yet and hubby puts Ro-Tel in practically everything he can ( have to watch him like a hawk). But it did taste great in the soup — added just enough zip. Perhaps Ro-tel could be your cure-all. I hope you’re feeling better soon. Sending you a big comforting HUG!! I do think that a can of tomatoes is a great addition to any chicken soup. Adds that bit of acid. We would love the pretzel too! 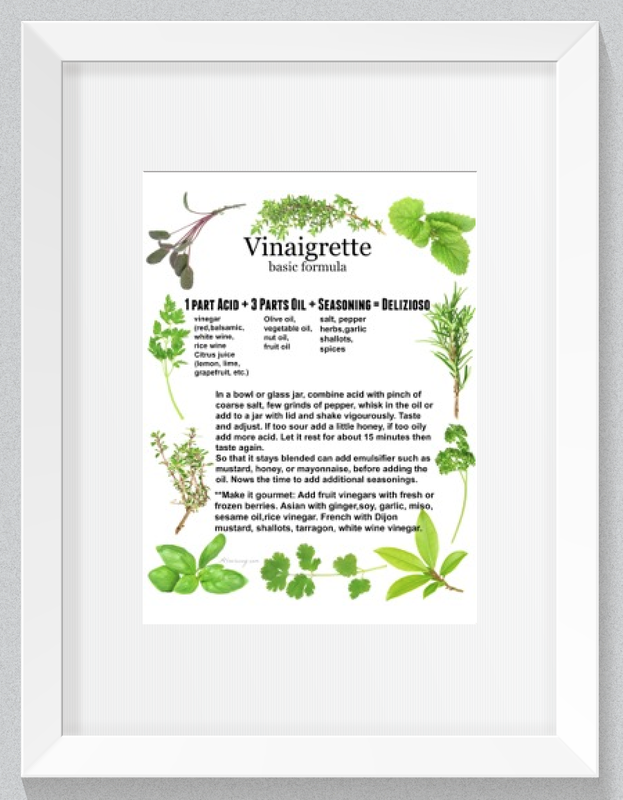 I was going to pass on this recipe, as I have a favorite recipe I’ve revised over the years – but after reading your comments and your honey’s inspiration of tossing in a can of Ro-tel, I decided to print it and try that next time. Sounds like a terrific alternative and, who knows? – it just might replace my tried & true!